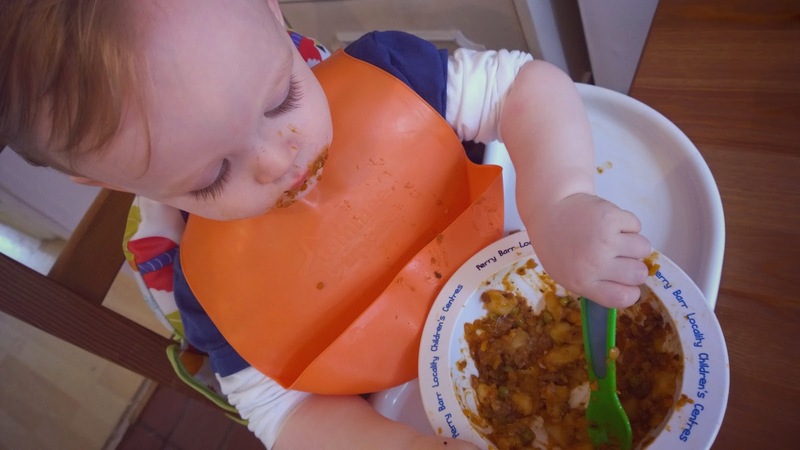 We started our weaning journey on the day Ethan turned six months old (as per the advice of the medical professionals but mainly as he seemed quite happy with bottles up until then), and we have never, touch wood, had any real problems. Ethan loves his veggies, scoffs bananas like they're going out of style, will eat all kinds of things at breakfast and has never been too fussy at dinner time either. When he was younger, if he didn't want something or he had eaten enough, he'd turn his head or shake his head a little. More recently, he's taken to spitting out the food when he doesn't want any more, which can be rather messy to say the least! Generally, he will eat whatever we have prepared or bought for him and he has a good appetite and seems to be gaining just the right amount of weight. 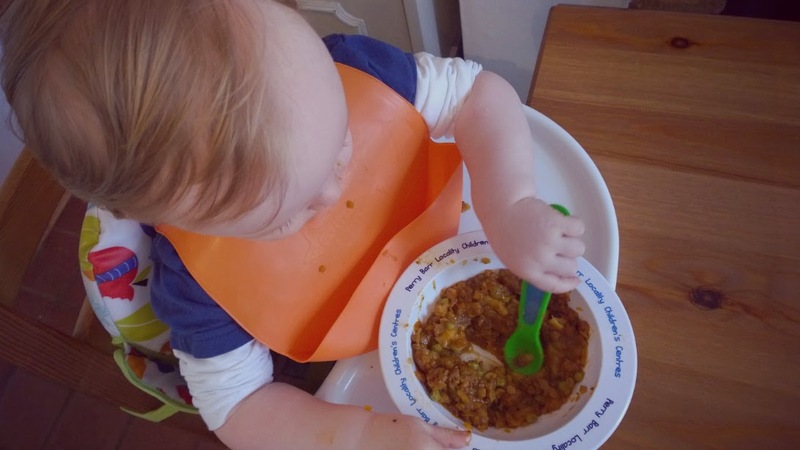 I chronicled our weaning journey (see below for links to my past posts on the subject) and essentially, we were led by Ethan when it came to introducing new foods. 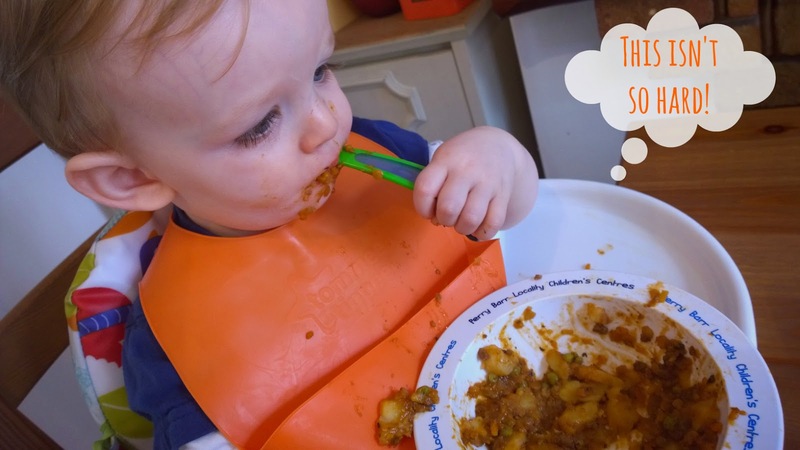 There's a lot of debate about the benefits of baby-led weaning and it seems to be the latest thing that 'professionals' are telling us we should be doing as parents for the good of our children. I'm very much of the mind that if something works then that's great but not every baby is the same so you need to follow your own path. 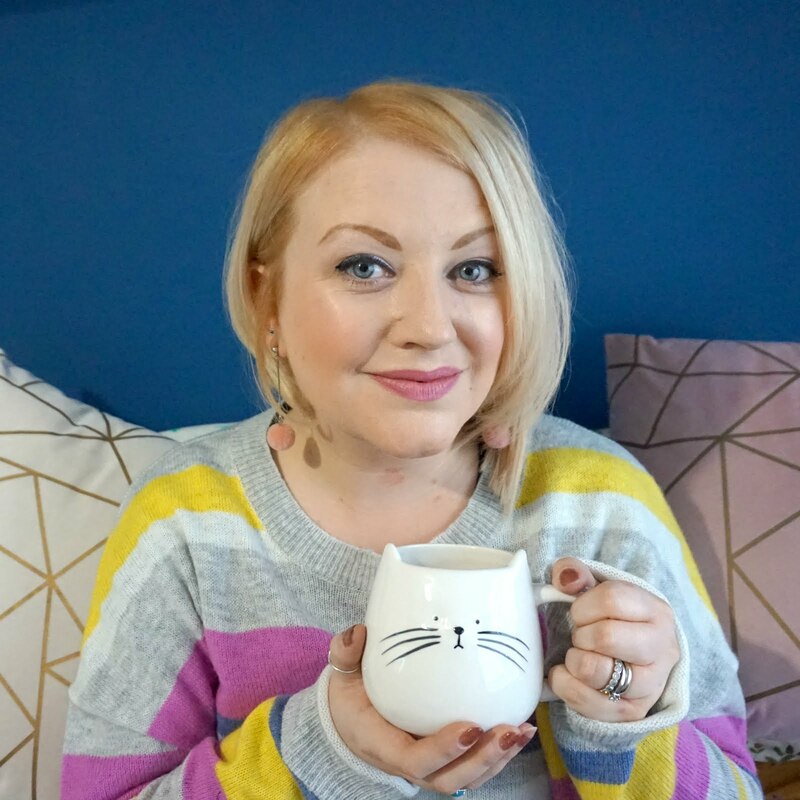 Sure, get lots of advice, read what the experts advise and speak to other mums, but just go with the flow and see what works for you and your baby. Trust me, they'll let you know what works best! I began with making my own purées, following Annabel Karmel to a T, with ready-made baby food at the ready for any fussy days or convenience when out and about. Over time, we introduced new flavours and textures, but if Ethan tried to pick up something up, we let him and as he got older, we introduced more finger foods so he could get to grips with feeding himself. However, up until now, Ethan has been fed things like cereal and his dinner dishes by us, with lunchtime and snacks being things that he could easily feed himself. We got into a routine of feeding him in his Baby Snug in the lounge but I realised that it's important that Ethan starts to learn how to use cutlery - and important for me to stop worrying about the subsequent mess that might be created! 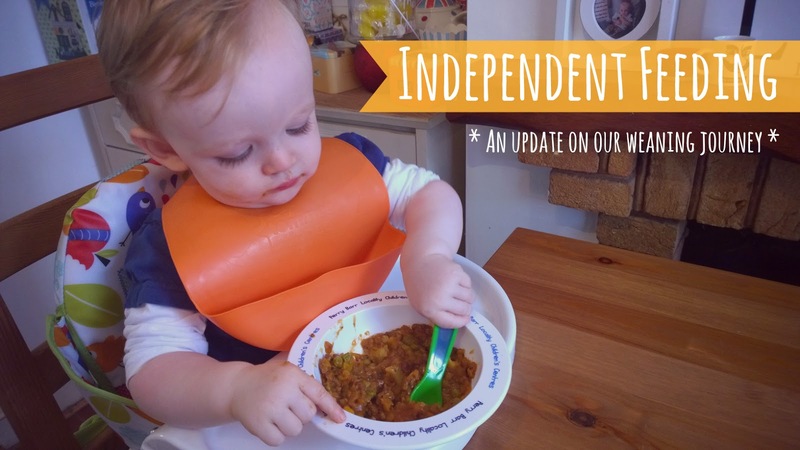 So, with the aim of moving Ethan on to 100% independent feeding, I popped a few things in the trolley on my last visit to Asda to help, including an anti-slip surface map, new washable bib with a nice deep crumb catcher and some toddler friendly cutlery. We also picked up a new seat so that Ethan could start sitting at the dining room table (we have a ceramic tile floor in there so any spills are easier to clean). 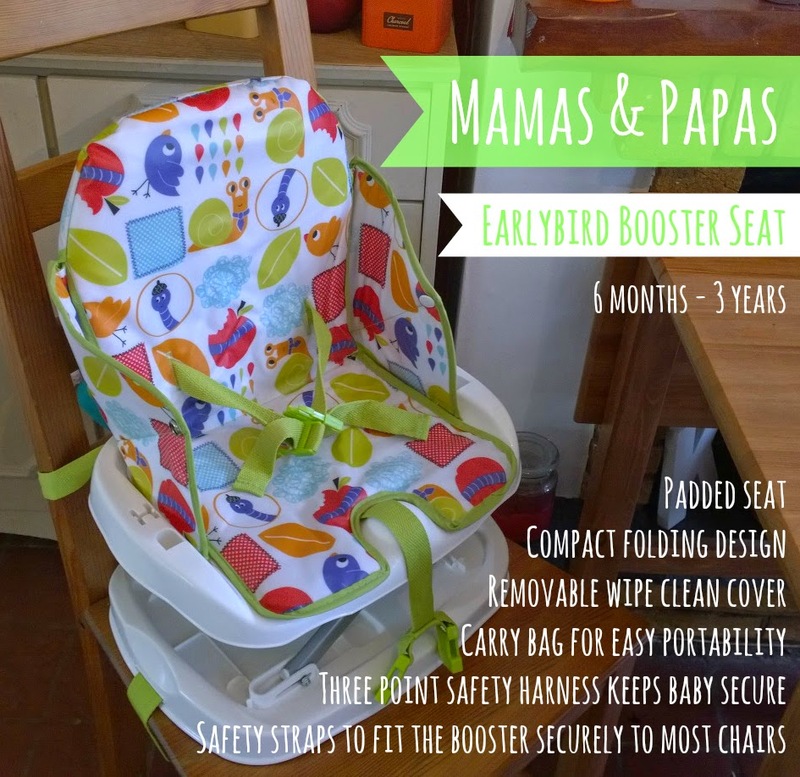 Asda currently has a special baby and toddler event and we managed to snap up the Mamas and Papas Earlybird Booster Seat for £30 and, having set it up at home already, I couldn't be happier with this purchase. It's a great, lightweight design that offers three seat height positions and a removable tray. It's suitable from six months to three years, so at nearly 16 months old, Ethan won't have the tray in front of him for too much longer but it should get quite a bit of use. It's the perfect seat solution for mealtimes and the straps are adjustable and secure so you can use the seat with almost any dining type chair. 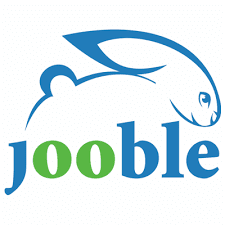 It's also easy to take away with you, which will be great for when we visit family and friends. Ethan seemed very pleased with his new chair and once his sleeves were rolled and his bib was secured, it was time to see what he would make of feeding himself. I'm not sure whether he's been practising in secret or if he's just learnt the ropes by watching us, but he took no time at all to start shovelling food in his mouth. Straight away, spoonful after spoonful, he managed to devour his lamb hotpot without any help from me. Sure, he had it all round his face, with lumps falling into his bib, but he was determined to feed himself and I was so proud watching him. I know it's only a small thing and other toddlers his age may already be masters of the knife and fork but for us, it was another milestone to mark off and another sign that my baby boy is growing up. I love the design on your high chair.